Etsy has now a . . . 'Drop Down Menu Description ' and you'll have to click on this to read everything. Month before and month of: Comic Con, Christmas, Halloween and Valentine's Day. We. . . CAN. . . . get . . . swamped with orders at these peak times ! < < < NEW !!! > > > NOW with the TITLE on the SPINE ! 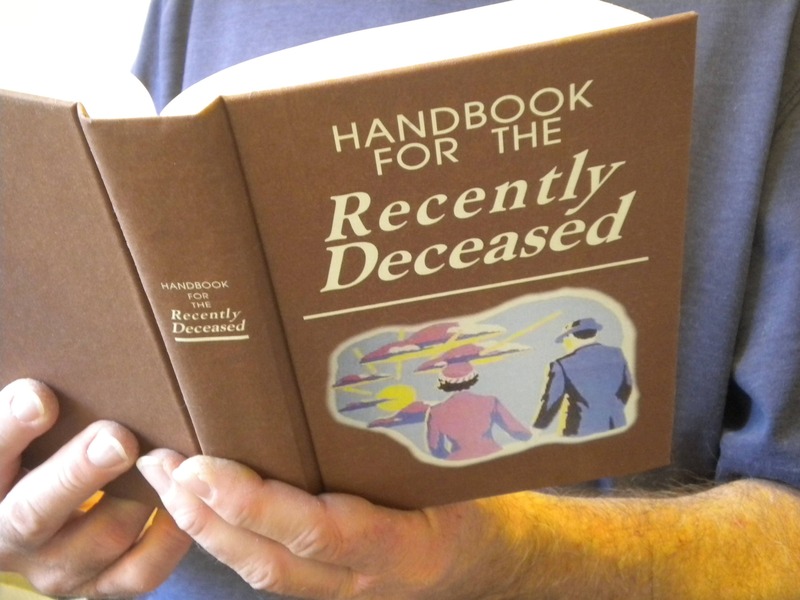 Handbook for the Recently Deceased, Hardback - Hardcover. Movie Prop replica - Fan-Handmade and completely hand-covered with a special printed cloth. This is / was. . . a pre-owned / old or used hardback book that has been hand-made into this wonderful table conversation piece. Comes with a: Beetlejuice / Betelgeuse flyer replica and an INSERT SHEET with lines/ words, used in the movie as quoted and/or read from the book . . . AND . . . . 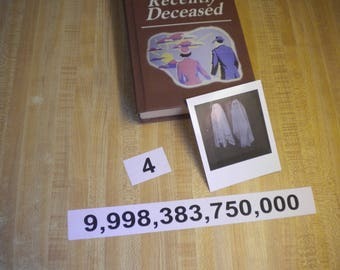 BOTH NUMBERS used in the Waiting Room and a reproduction Polaroid of the 2 ghosts ! Nice - sturdy heavy old book about 5 1/2 inches x 7 3/4 inches and over an inch thick. The book opens, but the contents of the book are that of other literature. The pages are NOT glued together. Great for a Theme or Halloween Party !
. . . Or a Really Nice Gift ! Also comes with 5 FREE Beetlejuice replica BUSINESS CARDS ! An adult - quality prop re-creation. depending on work load, as each one takes the better part of a day. know WHY they take so long to make them look GREAT ! > > > Hey hey hey. . .>>>>>>>> THIS. . . . IS NOT . . . . THE BLANK BOOK Beetlejuice Handbook/ Journal-Sketchbook . . . to write or draw in. >>>>>>>>We have the BLANK BOOK Beetlejuice Handbook listed on another listing. See our other listings for the BLANK BOOK that can actually be used, rather than just for "looks". ALL. . . of our books come with the Same Flyer, Same extra Beetlejuice Business Cards, etc. Free shipping on the Beetlejuice Business Card Orders. . . when shipped with a book order ! Great seller, fast shipping - recommended! Although the cover looks brilliant, the different "stories" within the book, was just not what I expected it to be. I thought it would be more gimmicky and quirky because of the movie. The extras (beetleguise card etc) just came across as very cheap and a bit of a waste as it was all printed on basic a4 printer paper. I couldn't see the "extras" within the box and when I messagsd about returning it, I was told I would need to send it back myself, but after already paying £30 for delivery already, there really wasn't much point in wasting more money. I wouldn't recommend this to anyone, but then again, I think I was just expecting something different. my lady loved it! the extras with the book was amazing and a great christmas gift.